Signup forms are useless when presented without knowing visitor interest, your visitors are likely to exit your site when they see signup forms on first sight. Instead, just ask them a simple question of Interest with Yes-No buttons, or Show them a brief offer, or a banner and when they react on the first frame by clicking buttons/links, show your signup form on second frame. As they clicked on first frame, they are likely to signup on second frame Form. 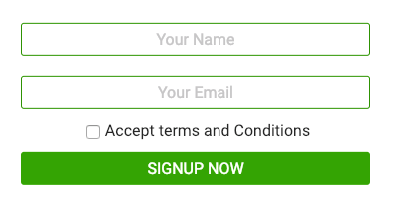 Often times you want to redirect your visitors to anther page when they signup on your forms to show them offers, how about personalizing them more? Optingun can redirect subscribers when they signup on the forms along with the name,email they just filled in, so when they are landed on the redirect URL, name and email are attached to that URL as GET parameters for you to use and customize their Experience. When your visitors signup to any Optingun form, we save their Name, Email on their devices securly encrypted, and when they visit another Optingun Form we help them by prefilling it with their previous details so its just a click for them to signup. And if you want you can disable it too. If your traffic is from other automation tools like autoresponders, you can actually add the user name on the link, and Optingun can pick that name and display it on the forms, so you can preset a unique for for every visitor. Amaze them by presenting personalized form-experience and gain their trust - grow your business.